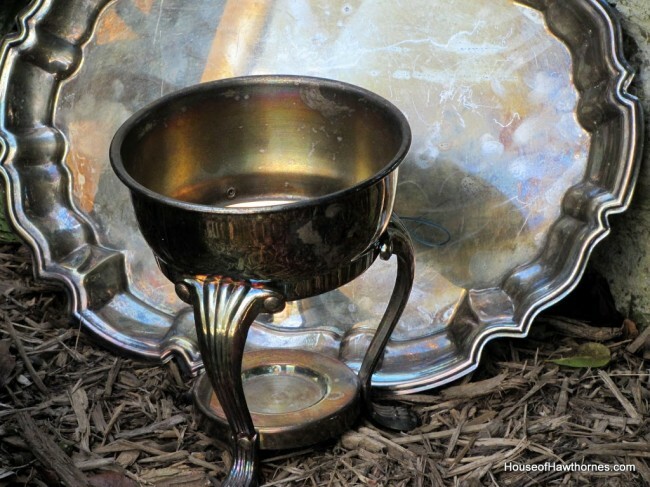 Home » Thrifting » When Is An Estate Sale Not An Estate Sale? When Is An Estate Sale Not An Estate Sale? On Friday I had to take the minivan for a checkup on the other side of town, so I searched Craigslist for sales in that area. And I was ecstatic when I found an estate sale that started on Friday less than a mile from the van dealership. Until I got there. I drive up to this “estate sale” and there are no signs in the yard, no little notice by the front door welcoming me to the sale, no other cars? WTH? The garage door was open, so I cautiously approached the garage. Yep, the garage was full of stuff. A little dog starts barking which is a bad sign, since you never see pets at an estate sale. Lady comes to the door. Out? What? OK, I could go on with our conversation for quite a while here, but long story shortened – turns out the lady was having a garage sale, not an estate sale. People, an estate sale is a sale conducted by a professional company when someone DIES or is moving to a retirement home in order to get rid of most of their belongings. Not when you want to attract people to your little itty bitty garage sale! So I bought nothing there, but did find a few things at a garage sale down the street. You know, where the people actually knew they were having a garage sale. 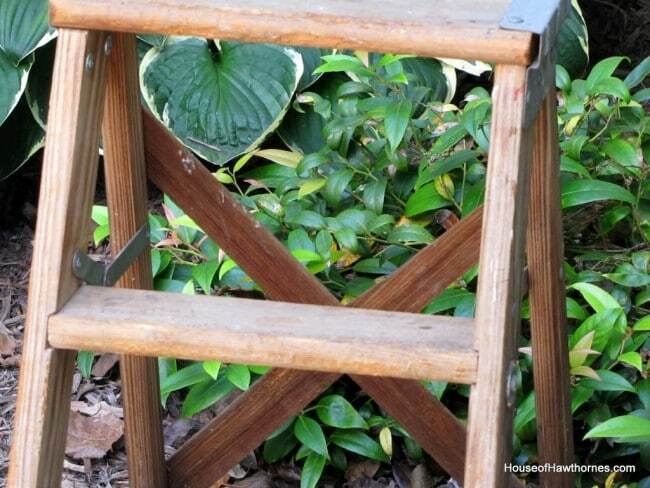 A wooden step ladder I am going to use in my Fall decor. 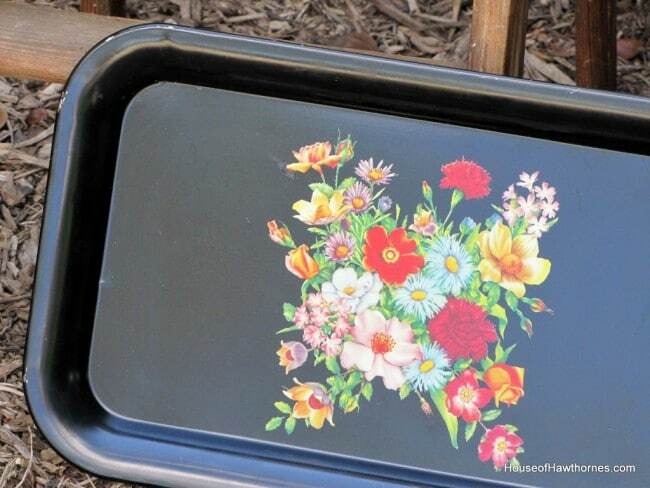 One of those metal trays from the 50’s or 60’s. A silverplated platter. And chafing holder which I will use to hold some sort of spherical item. So anyhow, does Estate Sale mean Estate Sale in your part of the country? Or is it just me that gets irked when people use the term liberally? Linking with Southern Hospitality‘s Today’s Thrifty Treasures, Coastal Charm‘s Nifty Thrifty Tuesday, Her Library Adventures‘ Thrift Store Finds. Well back home an Estate sale is just what you said not a garage sale! Good thing you found a better one and got some great stuff! I love those ladders and used to have one! LOL….I’m glad you found another sale, and bought some cute items…especially that little ladder. A lot of people do advertise sales as estate, but they are not. People tend to go to an estate sale as opposed to a garages. I went to one, I know it was not from their estate. Looked like things they bought from the dollar store or a business that might have closed. They are not supposed to do that, but guess they have not been caught. People do use estate sale here for a garage sale…especially if there is anything that belonged to Grandma!! Oh I hear you!!! Everybody and their sister now calls their junk and estate sale!! I have been those kind of “estate” sales, too…and yes, it bugged the hell out of me! I never see estate sales up here. We do have estate auctions, however. I can’t wait to see what you do with your step-stool and fall decor. Glad the day wasn’t a total bust. I totally understand about the estate sale/garage sale thing. It happens here too, and really makes me mad. And do you find that garage sales are getting more grungy too? We drive by more sales than we stop at these days. Junk,junk, junk. I totally would have picked up the same items you bought. Great finds! I agree with you about estate sale vs. garage sale. I think people do want to make their sale sound more upscale so they’ll call it an estate sale. I rarely have any luck at the “estate” sales around my area. Lol, I’m surprised I don’t see that happening here in Ct. after all we are the PT Barnum state (a sucker born every minute). I’m glad you didn’t buy from the woman who was deceptive. I didn’t donate to the organization that thought they were calling someone named Victoria when I answered my phone and then tried to get me to pledge money to their cause. If you have an honest cause, or sale you don’t need to fool anyone about it. 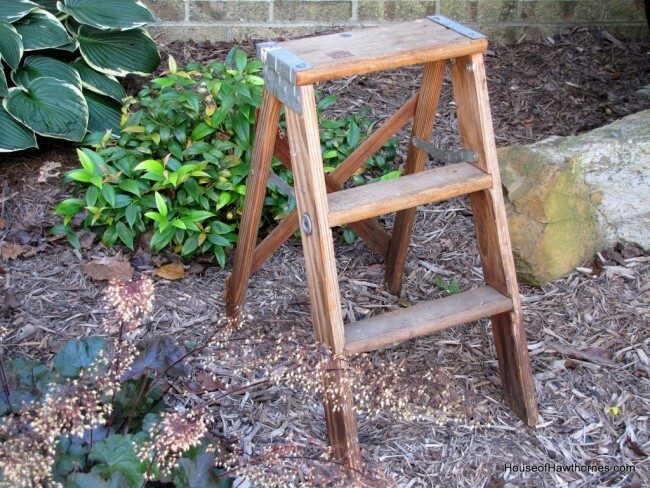 Love that little step ladder, it is going to be a great piece to use to decorate this fall. My idea of an estate sale is the same as yours….I’m glad you found another garage sale to hit! I think of estate sales the same way you do, Pam…although I’ve heard of some people having living estate sales…Fun finds anyway! I had nearly the EXACT same thing happen to me earlier this summer. And I made a fairly decent drive to attend. Fortunately, like you, I stumbled upon a garage sale with some nice things down the street. I don’t mind if it’s not run by a professional company, but it should mean that EVERYTHING in the house is for sale. Back from my mini-vacay and catching up on my reading. No, Estate does not mean Garage sale. And that woman knew exactly what she was doing with her tricks. By the way, I am in love with the jar/light do-hickey in the previous post. Such a cool idea! Estate sale here means an entire house is being liquidated but not necessarily by professionals. We have estate sales here all the time that are held by the owners, their kids, etc. but they certainly ARE (or should be) different than a garage sale! 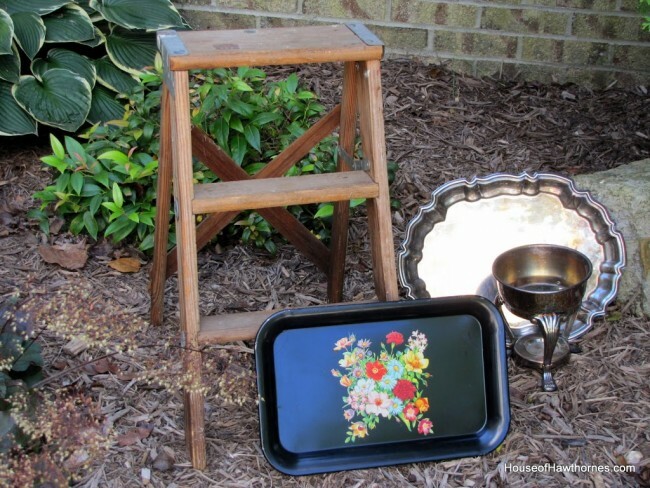 Glad you still found some great bargains — I love the ladder and tray especially! Aren’t you glad you didn’t drive way out of your way for her “estate sale”?! At least you found some neat things at the garage sale…love the little ladder!!! Every “Estate Sale” we have been to have been horrible so we don’t go anymore. I have to see stuff out before I will consider stopping. I had to chuckle when I read your post, I feel EXACTLY like you do! An Estate Sale is not someone’s left over junk aka their garage sale. When I think of an Estate Sale I think you should go INSIDE the house and every room should be opened up (well maybe they will have one bedroom closed off that has the few things the kids are keeping of their parents or something) and everything in every room is for sale! I was thrifting one day and we saw an Estate Sale sign so we quickly did a Uey and pulled in. It was a gorgeous house in a very old neighborhood so I quickly got excited thinking this was going to be great. Uh…no…we walked in and they had every room blocked off except the living room. Then the only things they had for sale were a couple of couches and a few odds and ends. To top it off they were trying to sell a bread machine (you know the kind you can get at Walmart for less than $50) and the price on it was $100!!!! I left quickly afraid they were going to charge us for the air we breathed while we were there. So, you are not alone in your thoughts and I think exactly like you do. Here’s what has been going on in this area, they have an empty house they can’t sell so once a month it becomes an estate sale. A few friends get together and bring in a load of yard sale items. Like you, I try to find something close to save the day. Oh, I missed this post and we have them around here. Here, it means that the contents of the house are for sale and that it will be a large sale- usually- but it always means that the prices are going to be high. As high or higher than in an antique mall. It means that the people having the sale have either had a dealer come in and help them price it OR, they have looked things up themselves either in the books or on ebay or both. Here, they are set up in the house of the person who either died or went to a nursing home, and it’s the family that is having the sale. Every now and then, it spreads out into the lawn, but most of the time it’s in the house and you can go from room to room. They run them for several days to 2 weekends in a row, depending on how much stuff they have and how things are selling. I usually steer clear of them. I would rather buy off of someone who puts a quarter on things and lets them go.